Take potatoes to a whole new level with this innovative new food creation by Jason King. If you're tired of boring potatoes this is a must try for you. Bacon wrapped, filled with any ingredients you like, topped with cheese and a delicious original volcano sauce mixture make this a absolute hit every time. These can be made with several different ingredients with flavors you like to taste so use this as a general outline while incorporating your favorite mixtures, spices, sauces and toppings so play around while being creative. Rinse the potatoes under cold water while scrubbing clean. Poke a few holes in the potatoes to allow steam to escape. Wrap them in aluminum foil as per a general BBQ baked potato. Place the potatoes directly on hot charcoal to par cook the inside while creating a a great skin at the same time. 20 minutes cooking time, turning every 5 minutes to evenly cook. As the potatoes are cooking away mix up the volcano sauce. This is optional but it's a great easy sauce to kick up any taters a bit. Mix the ½ cup of sour cream and 1 tablespoon of hot sauce. Add more to your taste. Place it in the fridge to let the flavors mingle while the potatoes cook away. Remove the potatoes and let cool to handle. Unwrap the aluminum foil to speed to the process. Choose the larger end of each potato to be the bottom and slice off ¼ inch making a flat bottom for the potato to stand up. Cut a zig zag pattern to take the top off. Using a apple coring tool or small spoon scoop out the middle of each potato. Wrap each potato with 4 slices of bacon. Use toothpicks to help pin down any loose ends. Take the deli meat and slice it into 1" squares. Fill the middle of the potatoes with layers of the slice deli meat and cheese until filled to the top. 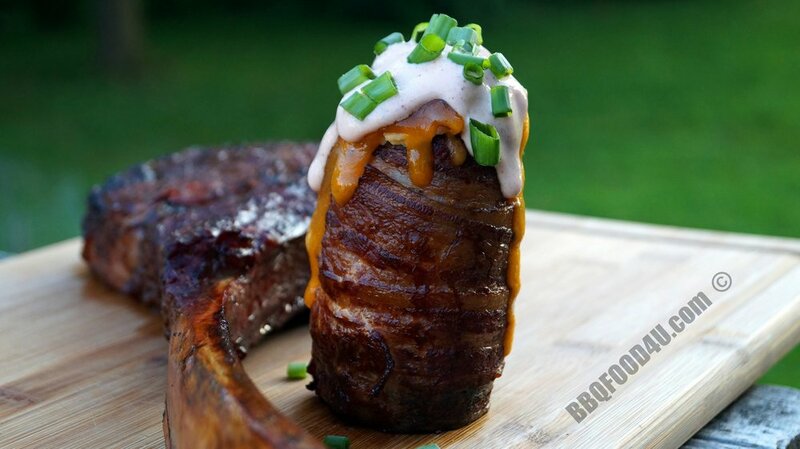 Cook the volcano potatoes indirect at 325* This recipe works in the oven as well as the barbecue just use a raised cooking grate. On the barbecue I use a small chunk of apple wood for a nice kiss of smoke but many other smoking woods will work great as well. Leave the lid shut and just let them cook for 45-60 minutes. For a extra layer of flavor coat them using your favorite BBQ sauce or glaze 5 minutes before the bacon is cooked to your liking. Take the potatoes off and top with the mixed up volcano sauce directly on top. It will heat up and start ruining down the side of the potato. Add diced green onion to the top and serve the best potatoes ever.